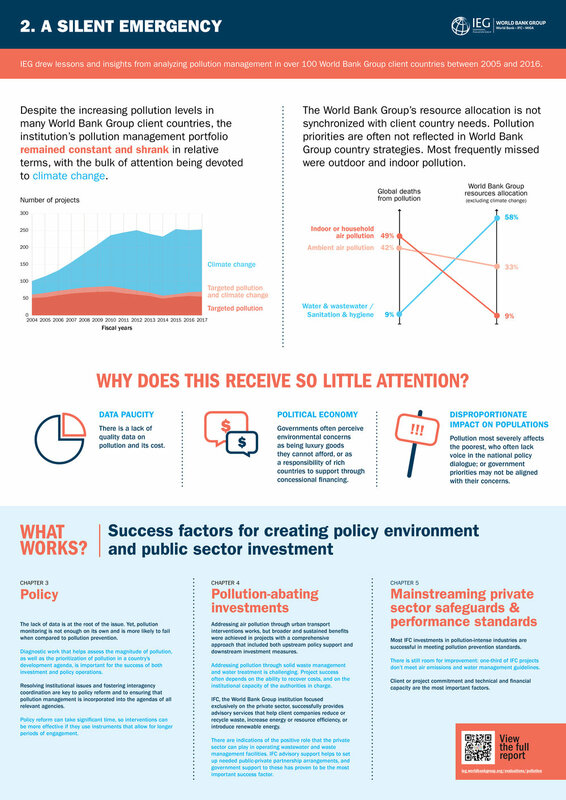 The Independent Evaluation Office of the World Bank Group approached us to create posters from their report Toward a Clean World for All: An Evaluation of the World Bank Group's Support to Pollution Management. The posters would be displayed at the IEG booth of the 2017 Environment Assembly organized by UN Environment in Nairobi, Kenya. On the first poster, a large headline summarizes one of the key findings of the study to catch the eye of the hundreds of participants, imitating newspapers and magazines. Then a graph summarizes the scale of the problem, put in context of other health issues that might be better known but less deadly. The goal was to make the reader quickly realize that this is a larger problem than they might have realized. It fit well with the message of the report, which is that the size of World Bank Group's interventions do not match the scale of the problem. The second poster focuses on the main message, that is the mismatch between the scale of the problem and the scale of the response. We use a stacked area chart to show the tremendous growth in climate change projects, but not in pollution-related ones. The slopegraph shows the difference between the proportion of deaths by types of pollution and the resources location of the World Bank Group. For the third poster, we expect the remaining audience to be very engaged and to have interest in the suggested solutions. This is why it is more text-centric as it is meant to present the observations of the evaluation group and the sequence of what they recommend to do. The posters were also converted into brochures that participation could take with them to read in more details. Below, the IEG representatives to the conference, proudly standing in front of the posters. Contact Voilà if you need help with your scientific posters.